Though I had great ideas of where to go hiking for Winter Break, it turned out we didn’t have a full day to devote to getting out of town. 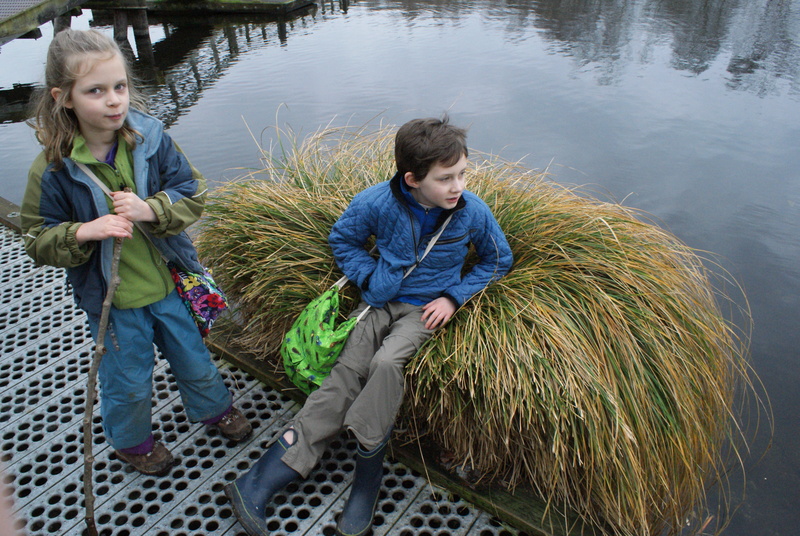 We were sorely in need of an outing, though, so we invited some friends along for a walk at the Arboretum in Seattle. We met K and C at the Visitor Center (they have heated bathrooms!) and took off to the north along the trail to the water. It was threatening rain, but we ended up getting only a few sprinkles. We visited the ducks at the first little water access area. When we got near the shore, the mallards started quacking. We thought maybe they were laughing at us, or telling each other we were there to feed them. We played with sticks and rocks and chatted. 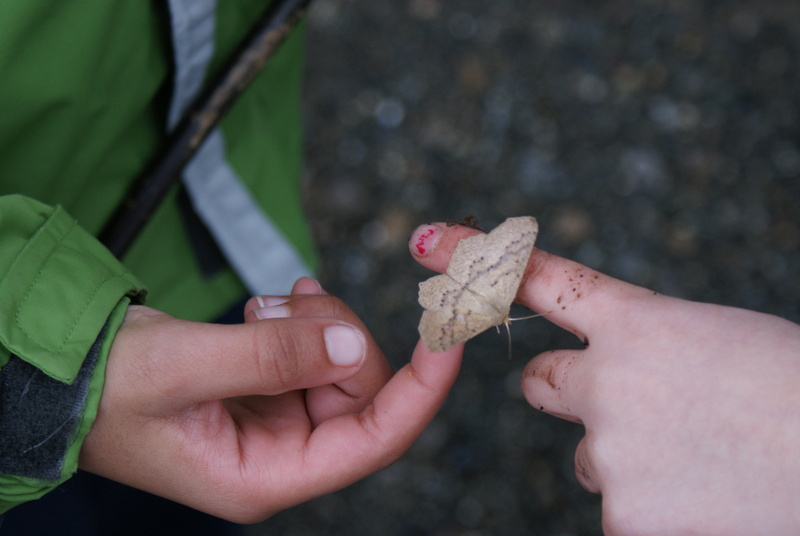 We found a moth on the shore that had pretty rough wings, and took some time to examine it, releasing it later to some bushes where it was safer. 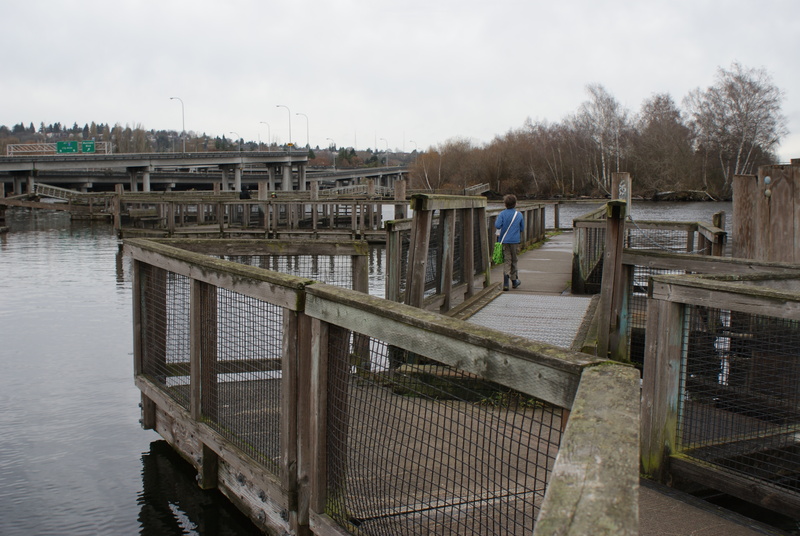 Then it was onward, over the bridge, through the park-like forest, under the freeway, and to the water. 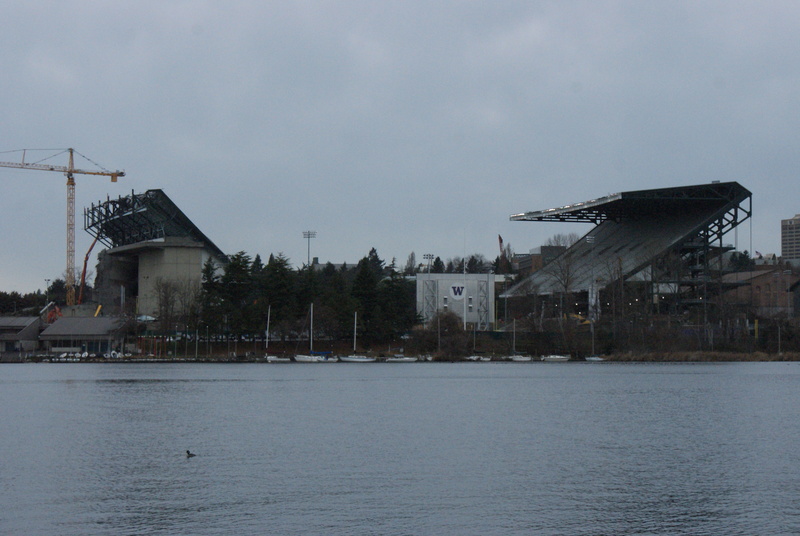 We could see the construction happening at Husky Stadium, and watched some boats go by. 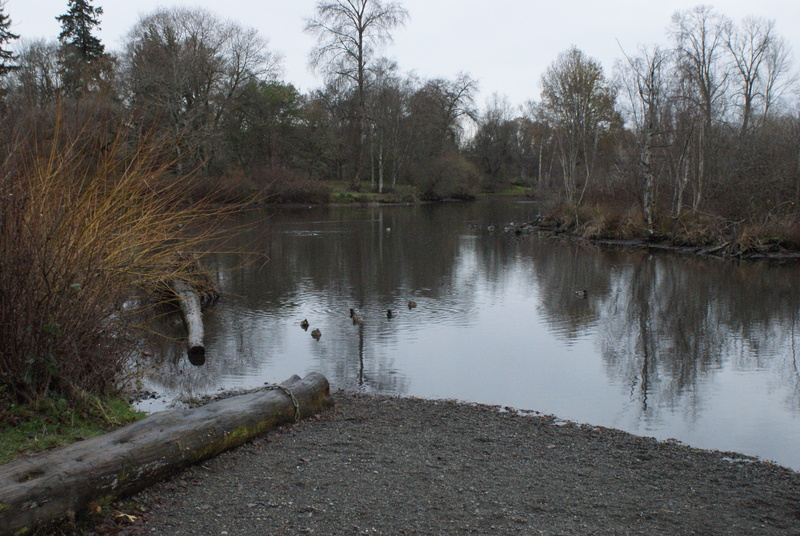 We were lucky to spy a bald eagle flying over the water near the other shore by the Center for Urban Horticulture. That was our closest eagle sighting of the day. 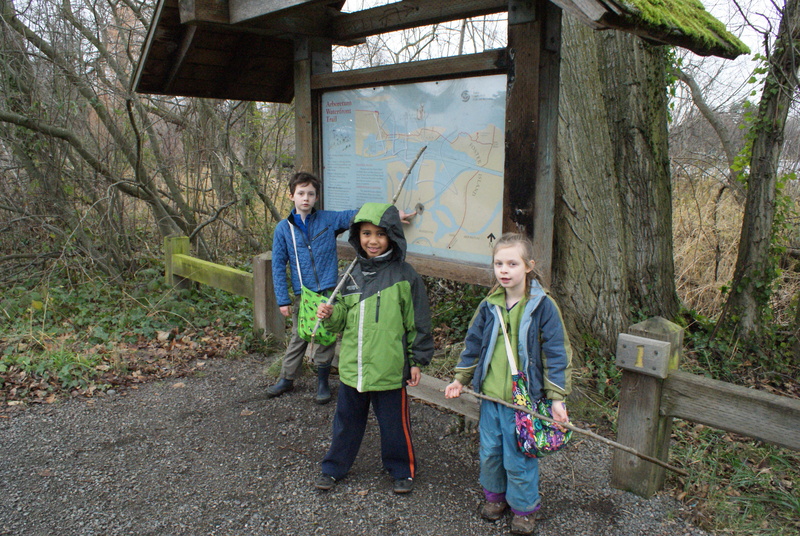 We dispensed some snacks here, then continued on to the path onto Foster and Marsh Islands. 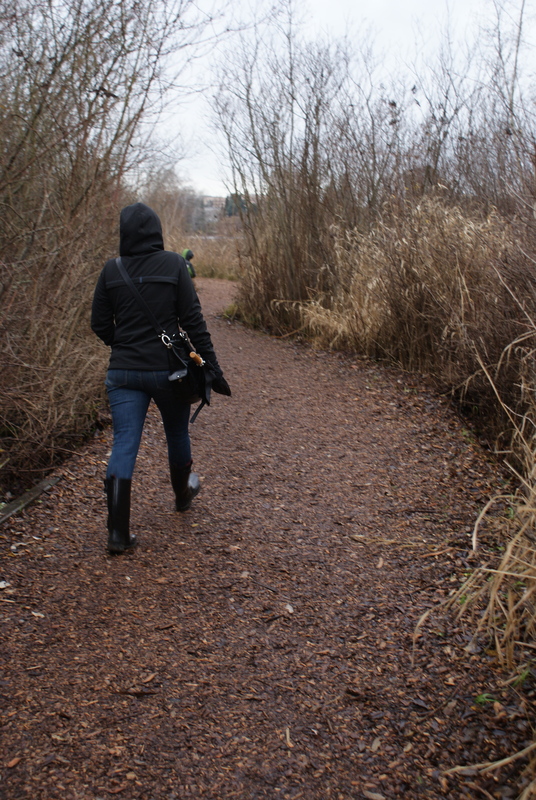 This is my favorite part of the trail, winding through grasses and cattails, over the water and under trees. We saw several species of ducks throughout the day, including mallards, gadwalls, buffleheads, green-winged teals, and a common merganser. We saw a few cormorants and possibly a hawk-type bird. We had hoped to see the turtles, but they were absent. We looked them up in my reptile and amphibian book and learned that they hibernate in mud in winter, though they occasionally come out to bask on logs. 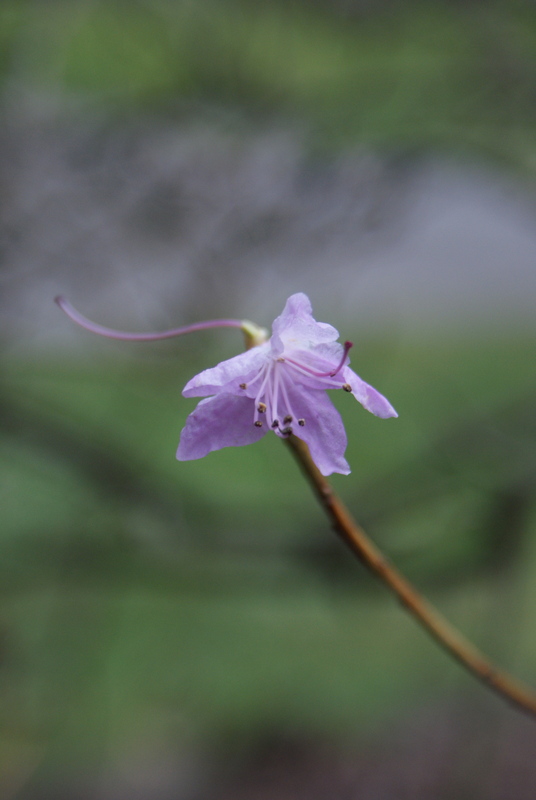 Most of the plants were in their winter browns, but we did see some plants in the garden part of the Arboretum that had flowers. 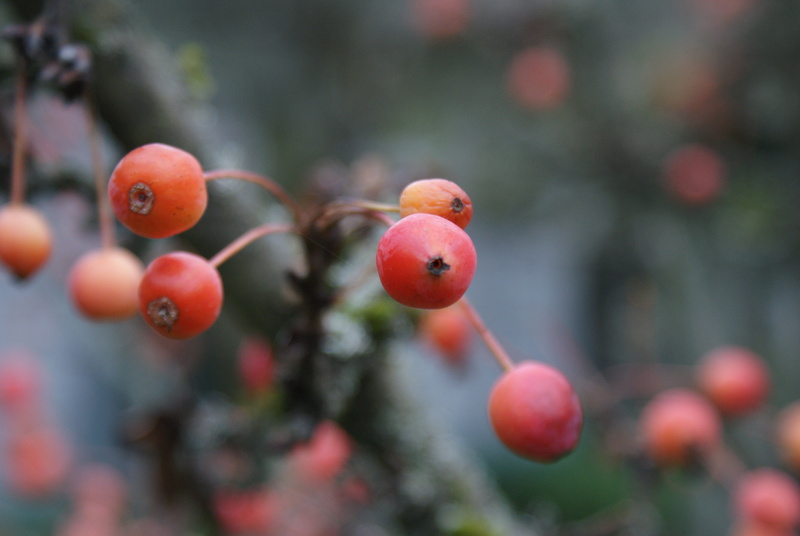 Many trees had obvious buds on the tips of their branches, too. It always surprises and delights me to see these foreshadowings of spring and summer in the dead of winter. We managed to walk all the way to the Museum of History and Industry parking lot and back. The kids were definitely ready for lunch, and the nice folks in the Visitor Center let us eat inside on the benches. Overall it was a good day to get some fresh air and see what we could see. We were thankful to have friends along to share our walk today. Gabriel wants to come back and see more of the garden, particularly the Japanese maples and the various theme gardens. We’ll have to make it a higher priority to visit this local gem more often.